Mobiquity participated in the recent Dutch Hacking Health hackathon, a two-day event focused on creating innovative solutions for health and healthcare. The team we were a part of came up with a user-centric solution aimed at relieving the stress that arises from ever-changing cancer treatment schedules. 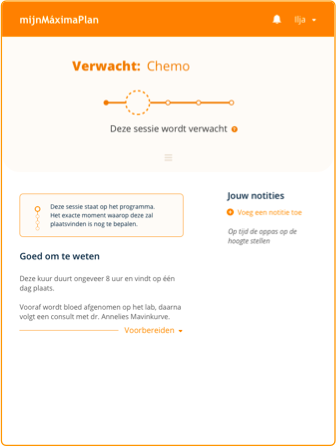 Even if everyone in the Netherlands could understand the level of English used in the overview shown above, they would most likely still need a degree in oncology to make sense of the words on the paper. 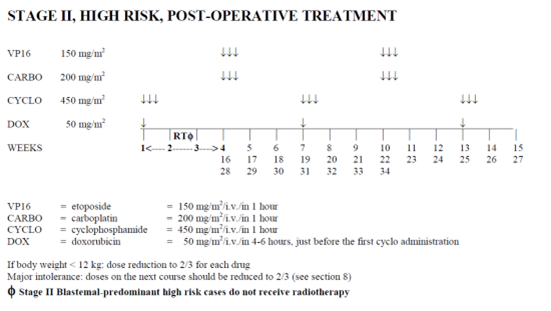 On top of that, actual treatment dates are not clear; the overview only shows the week numbers for which chemotherapy is potentially scheduled. Appointments may actually fall on any day during the planned week, just before it or just after it based on the both the doctor’s schedule and child’s treatment plan. In turn, parents and siblings must deal with the uncertainty of when treatments will take place on top of the uncertainty surrounding the child’s health. More often than not, families’ lives become entirely focused on the child’s chemotherapy appointments (that can take up to eight hours per session), leaving little space for siblings, relatives and themselves. Birthdays, holidays, leisure activities - everything is scheduled after treatment dates are known. Mobiquity is familiar with the uncertainties and stresses of treatment for child cancer patients because, as you might have seen, we recently announced a partnership with The Princess Máxima Center for pediatric oncology. One of The Princess Máxima Center’s innovation objectives is to improve the communication that parents and children receive around treatment as well as the quality of the information shared. The first step to achieving this aim is to make the complex pediatric oncology protocol easier to understand for patients and their families. The Dutch Hacking Health hackathon was the perfect event for us to collaborate as partners and take this step. Dutch Hacking Health was held from the 19th to the 21st of May 2017 in five major cities in the Netherlands. It was organised by the country’s academic hospitals and brought teams of health professionals, patients, developers, designers and entrepreneurs together. Teams joined force to create innovative solutions for health and healthcare. Five of our own employees and friends partnered with team members from the Princess Máxima Center, IT & business service provider CGI and educational institute Hogeschool van Nijmegen and Arnhem (HAN) to work on a solution for improving communication and information quality around treatment. The kick-off was on Friday, Saturday was spent brainstorming and setting up a base for the user-centric design, and the prototype was presented on Sunday. The patient journey had been mapped during the weeks prior to the hackathon. Whilst CGI focused on the back-end solution using its Spade generation software, Mobiquity designed and built a connecting front-end for a web-based mobile application. As product owner, the Princess Maxima Center brought healthcare insights and needs, and enabled validation of user stories. As our Senior Tech Manager Jieke Pan explained, “There is a tendency to provide people with as much information as possible. After speaking with the experts, we realised that there can be such a thing as too much information. Parents don’t want to know what happens in a year’s time. They want to know what happens in the next two, maybe three, weeks. They want to be able to live their daily lives as normally as possible.” In addition to addressing the amount and quality of information provided, two other requirements were that parents were notified of any changes or confirmations by mobile phone (no contact with the hospital required) and that the solution worked with systems they already knew, i.e. their mobile phone, iPad or Alexa. By Sunday afternoon, the team had built a working prototype: an app and IoT device for speech recognition (Alexa), that was able to exchange data with the Electronic Patient File (EPD) through several back-end services. The app uses real life healthcare industry standards for data called Health & Care Information Models (HCIM) or Zorginformatiebouwstenen (ZIB). In user terminology, parents can consult the app or ask Alexa if and when their child’s next treatments are due without contacting the hospital. Notifications also inform parents of the exact treatment dates and what to bring as well as tell the child how many beads the treatment is worth (at the Princess Máxima Center, children receive one or more beads after each treatment. They string them together, and the longer the resulting necklace, the more it impresses the other children). Next is an evaluation by the Princess Máxima Center with Mobiquity, CGI and the HAN to determine how we can take the prototype to the next level. This will be done in their Innovation Lab, in close cooperation with parents, children and medical professionals.